This Saturday 27th October, legendary sound man Duke Vin joins DJ Cello as guest DJ at Coast to Coast. Duke Vin is an important figure in the history of Jamaican music and is said to have one of the best collections in the world. He is also famed for having the only existing original copy of killer Derrick Harriott produced tune "The Tickler". Duke Vin began his career in the early 1950s as a selector for Tom The Great Sebastian - the first major Sound System in Jamaica. He moved to London later in the decade, introducing England to Jamaican music - ska - through his Sound System, which was one of the first in the UK. During the 1960s, Duke Vin played at London's top West End clubs: the original Marquee club on Oxford Street and then in it's new premises on Wardour Street, as well as The Flamingo, also on Wardour Street. Back in 2003, I myself was honoured to have Duke Vin DJ for me at Right On! @ The Thirteen Club in Gerrard Street. This was a rare chance to hear him play in a smart West End club a stone's throw from the location of the Flamingo club where he played in the 1960s. This night was a sell-out and the biggest crowd we'd had to date. 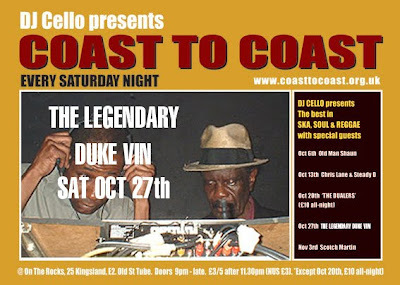 If you love your ska and have not caught Duke Vin in session before, I'd recommend checking out Coast To Coast tomorrow - but do arrive early to ensure you get in.